The children in our programs and their parents are part of our extended family. 4-Kids Child Care Learning Center is dedicated to providing childcare services that areclassroom involvement dramatically superior to those generally offered to parents. We create and implement modern developmental programs and engage in a flexible while nurturing environment for every child in our care. We encourage parent participation and involvement through parent-teacher conferences offered 2 times per school year, progress reports, regular parent letters and daily communications with the child's teacher. All or our programs ages 2-5 years old are preschool based curriculum and use emerging curriculum. Which allows the children to develop and learn what interest them guided from highly qualified teaching staff. We acknowledge that parents are the most significant people in a child's life. We endorse and actively support the hopes and desires that all parents have for their children. 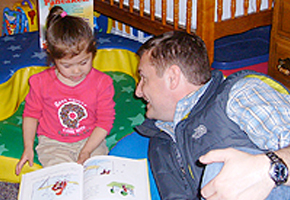 Parent participation is encouraged through a variety of activities and communications. As parents ourselves, and as caregivers, we are dedicated to being sensitive to the personal, parental and economic needs of parents. We recognize each child's uniqueness. We support the development of social, emotional, intellectual and physical needs and abilities of each individual child. We identify "play" as the work of the child. Children naturally learn concepts, develop skills, master life's situations, and enhance their language abilities through play. Constructive play helps children feel good about themselves and their ability to learn and gives them the confidence to explore new situations. We focus on providing a variety of learning opportunities throughout the day, helping to prepare children for life by teaching self-help skills and to prepare them for school and life-long learning. We emphasize professionalism in our childcare programs. We strive to further the education and expertise of our staff by providing periodic seminars; training programs and encouraging additional course work. We provide a safe, healthy and architecturally sound environment designed specifically for childcare. The environment is enriched to encourage exploration, initiative and problem solving.